Residents of Roanoke, Virginia, are putting on their dancing shoes. Social dance instructors and dance group leaders bring more than 1,400 people together under one name — Roanoke Dance for Fun. They use Meetup.com as a central calendar for Roanoke dance events. In order to raise the necessary money to support the group’s Meetup site, organizer Vianne Greek used SignUpGenius to register participants for an annual line dancing event. “We used SignUpGenius as the online registration site for that event because the site gave us a way to have multiple sign up options with different cost factors for our users, and provided a painless way for our registrants to sign up online and pay by credit card,” Greek says. Greek was able to set up a way for participants to register and pay for a day-long line dance workshop, the social dancing part at night, or both. 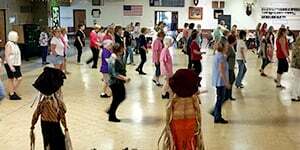 Eighty-five people attended Roanoke Dance for Fun’s first line dancing event last year, and Greek said they hope to have 100-125 people attend this year. SignUpGenius is thrilled to help groups like Roanoke Dance for Fun organize people and collect money more efficiently. Bust a move, genius dancers!